The Heritage Council of Victoria and Heritage Victoria have created a new way to tell the stories of Victoria’s past to young primary school children. They have developed archaeology education kits for 85 government schools in Victoria, in close consultation with the History Teachers Association of Victoria. The kits – for students from Foundation to Grade 2 – feature actual archaeological artefacts dug up from sites around the State. Worksheets and activities have been created to accompany the artefacts to get students thinking about our heritage and history. There are more than 6,000 archaeological sites throughout Victoria, ranging from the remains of former gaols, residences, businesses, and the Goldfields. Heritage Victoria archaeologists selected the artefacts for each kit with each containing ceramic pieces, shells, bottles, and personal objects such as combs, pencils or toys. These items are commonly found on Victorian archaeological sites and provide information about the people who used them. 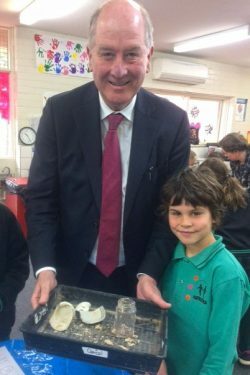 Planning Minister Richard Wynne launched the kits at Yarra Primary School today, assisting students to sift through sand for the rich pieces of Victoria’s past.